Last weekend, I went to my friend Yin‘s house for dinner. I had my first bite of the Mission district’s famed Delfina pizza. But, even more excitingly (and that’s saying a lot, because Delfina pizza is delicious), I tried Yin’s homemade granola. I love granola, but often find it prohibitively expensive. I’ve tried making it at home, but it’s always tasted…not quite right. Yin’s granola surpassed the store bought. The secret ingredient? Coconut oil! 1. Preheat the oven to 300 degrees F. Line a baking sheet with parchment paper. 3. In a small bowl, mix the wet ingredients. 4. Drizzle the wet ingredients over the dry ingredients. Stir to incorporate. 5. Pour the mixture onto the baking sheet, spreading into a single layer. 6. Bake until granola is golden brown (~30 min. ), stirring every 10 min. 7. Let granola cool completely before storing in an airtight container. 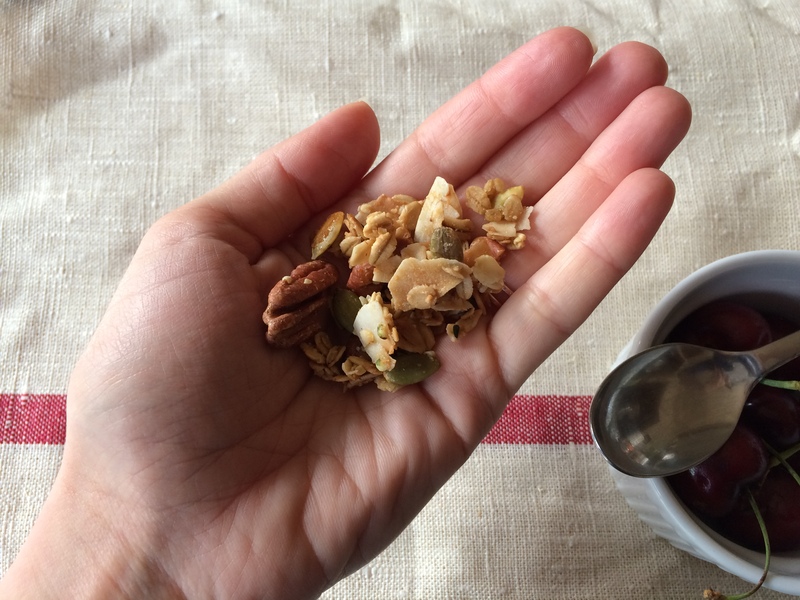 This recipe makes roughly 5 c. granola, which will keep for up to one month. I bought the ingredients this evening, and am looking forward to making a batch tomorrow. P.S. My favorite kale salad and a tip for enjoying peach season.